We don't need to be genealogists anymore!!! Yippee! I guess the list could go on indefinitely. I can't imagine what such a world would look like. A world without pain or sorrow of any kind. A virtual utopia where all of your ancestors line up and identify themselves on some huge all-knowing family tree. A place were genealogists were never invented because everyone just knew their ancestors by memory and they were all 100% accurate in their memories. I am so happy we have finally reached this pinacle of civilization so we can cast off the genealogical shackles of our past and move on to greater and more satisfying activities like filling the names in on an endlessly extending pedigree that goes back to the primeval ooze. Wait a minute. What on earth are these people saying? No more need to be a genealogist? I guess the whole idea of seeking out your ancestors is out of vogue. It is much easier just to go online and copy down some stuff from one of the millions of family trees and claim it as your own "ancestry" and leave it at that. Why pay good money that could go for movies or candy to those greedy online subscription database people? Who needs any of that if there is no need for anyone to be a genealogist anymore? Well there goes another 35 years of my life down the drain. I guess I was just born 35 years too early. Just think how useless all that time I spent in the Family History Library has turned out to be. If I had been born today, I could have been spared all those months and years I spent entering in thousands of names, dates, sources, and other historical information. I guess I also wasted my time digitizing over 100,000 documents and photos that are now utterly useless because there will be no genealogists to research and record, evaluate and extract all the information from all those records. Oh, well think of all the shuffleboard games I missed! 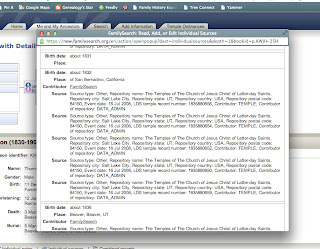 Do I need my own genealogy database program? The most commonly asked question at the recent Northern California Family History Expo in Sacramento was whether or not genealogists really needed a local decktop genealogy database program. The question arises in the context of all of the online family tree programs when many are apparently using Ancestry.com, MyHeritage.com or FamilySearch.org's Family Tree as their primary database. Many of these people were not using any other program. The traditional answer to that question has always been a resounding yes, you certainly do need a desktop (or your own) program. But as time passes, the arguments in favor of a local vs. an online program start to get fuzzy and less compelling. In the case of FamilySearch Family Tree, where the program is free and now has stories, photos, sources and will certainly add online documents, responding to this question has become more of a discussion of needs rather than a simple yes/no response. 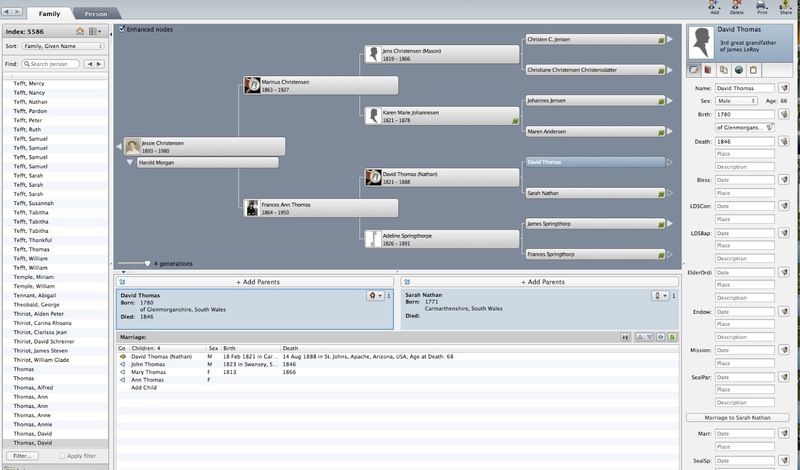 I am still finding a huge reservoir of Personal Ancestral File (PAF) users. A significant percentage of the people who spoke to me at the Expo, explained that they were still using PAF. I suggest that for people who are in that category, it would be extremely helpful for preservation purposes, if they would put all of their data online. Then, when they could no longer access their PAF data for whatever reason, they would still have a complete backup of their files online. In fact, I would prefer that these people move to using an online database entirely if they do not want to move to any other program. The discontinuance of support of PAF by FamilySearch is largely symbolic. In a class of over 75 people, when I asked if any of them had ever called FamilySearch for support with their PAF programs or ever, not one hand went up. But symbolic or not, it is causing more of the die-hard PAF users to examine whether or not they want to move to another program and hence the question about whether they cannot just use FamilySearch Family Tree or some other online program. It is my perception that younger users of computers and especially mobile devices will have no clear perception of the difference between an online program and one that resides in their own computer. In fact, the distinction may disappear entirely. Companies such as Microsoft and Adobe are now providing their software through online subscriptions, not through the sale of individual products. I expect that boxed software will slow (or maybe even quickly) disappear from the market. Instead of buying a box, you will simply download the software and any documentation you may get with the program. This transition is inevitable as the CD/DVD technology begins to disappear. Many computers are sold today without an optical (CD/DVD) drive. The transition to distributing movies and other files formerly sold on CDs or DVDs will also disappear as more and more people use downloadable files for movies and audio recordings. So, if the software programs all move to distributed network connected products, the concept of having a local on-your-computer program will disappear and so why worry about the distinction. The real issue is not having the program on your computer, but having a local, master copy of your data on your own computer or under your control. Quite frankly, I would not care if the program I was using was "online" or on my local computer as long as I had my own personal copy of the data. The secondary question that arises is compatibility. As long as the large online databases are insular and the files do not share content, there is an added issue of preserving the information is one or another of these online services decided to go out of business. This hasn't happened in a major way yet, but it is inevitable. So until there is an adequate way of moving the data from one database to another, without the loss of information this presently entails, local software and storage is the only solution. So I look at three levels. The first level is the new or casual user who may or may not become serious about pursuing their genealogical heritage. In this case, whether or not they want to use an online tree or an local program should be entirely equally available and optional. The second level includes people whose primary database is PAF. I suggest rather than encouraging them to adopt another program, that they put their files online so at least the data they have is preserved. The last group are those who already have a local database and for the time being, they should simply keep doing business as usual but watch for the trends when local programs begin to disappear. 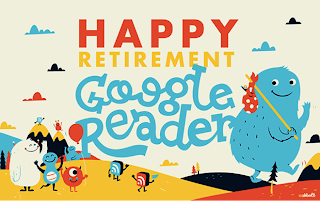 Google's decision to retire their Reader program caused an initial stir in the online community and boiled over into the genealogical community. I was a long time user of Reader and enjoyed the convenience, but all in all, it was a pretty simple and straightforward app with few features. Sometimes simple is good and in this case it was free, available and worked. 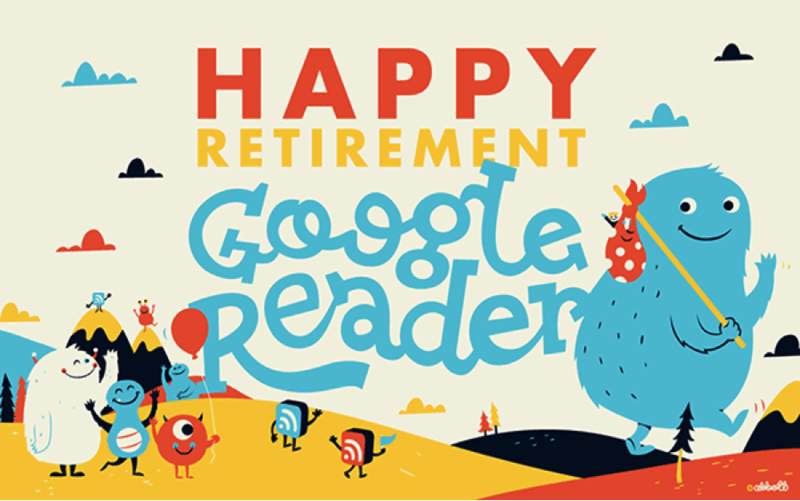 Even before Google announced Reader's retirement, I had already investigated quite a few alternatives. It took me only a few minutes to decide on one of the best replacement candidates; Feedly.com. But even considering I was able to find a replacement for a particular program, the underlying reason I will not miss Reader is that it was "just another program." Over the years I have used hundreds, perhaps thousands, of programs and most of them I have forgotten. Programs come and go, some faster than others. Some of the programs I am using today are hardly recognizable from their original versions such as the current versions of Microsoft Word and Adobe Photoshop when compared to their initial release versions. I always wonder if the same people who agonize over changing from on program to another have the same problems buying cars and appliances? Or clothes? For example, if you wanted to subscribe to this blog, you would click the link at the top of the page to subscribe to the feeds or posts and add my blog to your reader's list. If you use Feedly.com, you simply click on the plus sign to add a blog or website and put in the URL (address). Feedly.com will then add any new posts to the list of new items it generates all day long every day. Since I subscribe to over 200 blogs and websites, I get quite a list everyday and I use the Feedly.com program to review the topics of each item to see if I want to open it and read it. That way, I only have to read what I am really interested in. I also don't miss any of the cute pictures from my family. Simply put, one less program in the world doesn't make much difference. If there is a need for the function, someone else either has already written a replacement or there is already something better out there waiting to become popular. As genealogists we should be acutely aware of the importance of photographs in creating our family history and bringing it alive for present viewers. We have an important role in preserved our photographic heritage. Most photographs are a unique artifact. This is especially true for older photos, before about 1920 or so. and it may be true for modern photographic processes also, such as 35mm slides and other processes. Historically, it was rare that multiple copies were made from the same negative; either glass or acetate. Unless the negative has survived, the original photo may be the sole surviving print. If the negatives survive, technically it is possible to make a photographic print from the original negatives, but especially for the older glass negatives, this may be very expensive and/or difficult to do. It much more efficient to make a digitized copy of the negative and then "develop" the copy using a program such as Adobe Photoshop or a similar program. It is interesting, but the quality and stability of the very old glass negatives is usually better than later acetate negatives. Perhaps a little history would be helpful here. Photography went through several major phases beginning in the earliest times from about 1800. The claims to the earliest photographs all fall in the mid- to early 1800s with the "Boulevard du Temple", a daguerreotype made by Louis Daguerre in 1838, the photograph generally accepted as the earliest one of people. See Wikipedia: History of Photography. The photographs made by the process developed by Louis Daguerre became known as a Daguerrotypes. Although many of these early Daguerrotypes survive, they are usually considered priceless museum pieces. Each Daguerrotype or other similar process photograph was an original and could not be easily duplicated. In the second stage of photography, (of course this is greatly compressed summary) process were developed to create a "negative" image from which multiple "positive" images could be made. One of the most successful of these processes involved using glass as the medium for the negative image. Without going into a discussion of how this worked, suffice it to say that the glass negatives that resulted were often of very high quality that matches the quality of prints made today by any other process. In the final stage of photography, negatives were made of acetate or other similar substances and of course, as digital photography took over in the last ten years or so, film photography has become a rather specialized "historic preservation" hobby. Please start with the Library of Congress Preservation Section. The Library of Congress is very active in both artifact (photographs) preservation and digital preservation (the preservation of digital images). This image appeared in my inbox from Feedly.com. At the same time, I got a notice on my iGoogle page that Reader was now discontinued and should be deleted. Since I had transitioned to Feedly.com some time ago, the end of the Reader app was relatively painless. It is sort of like if Home Depot all of sudden decided not to sell lumber any more. From the users standpoint it seems pretty silly to send all your customers to competitors. But then, I suppose, that Google has some grand plan that will ultimately benefit its takeover of the entire computer community. Actually, Feedly.com is a much better product than Reader ever was. I don't mind it at all. Too bad, but I won't be sad. 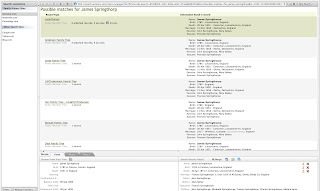 As far as I have seen, the FamilySearch imposed deadline of 30 June 2013 for the third-party developers to certify for Family Tree or be partially blocked from New.FamilySearch.org is still in place. There has been a scramble, by some, to get certified on time. Since we only have two days left (and a weekend at that) before July rolls around, I would guess that either the remaining developers have made some other arrangements, or they are not going to try for Family Tree certification until sometime later or ever. Let me set the stage here. 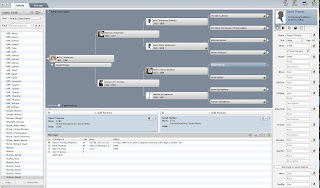 FamilySearch.org Family Tree (FSFT) is the replacement for the now abandoned New.FamilySearch.org (NFS). FSFT has been live and active for over a year and has undergone a considerable amount of development and changes. FamilySearch.org has a huge customer base. As one of the four major genealogically oriented websites, it has a prominent place in the genealogical community. However, mainly due to the demographics of the community, moving the users of the website to new products is a slow and tedious project. For example, Personal Ancestral File, FamilySearch’s desktop software program was abandoned and stopped development in 2002, but it is only now in 2013 that the abandonment was formalized. Despite this, there are likely hundreds of thousands of Personal Ancestral File users who are still using the program. In the same vein, there are likely very many NFS users who are entirely unaware of the change over to Family Tree. But waiting for some of the NFS users to move to FSFT would be a very long wait. Some of them would never voluntarily change: hence, the deadlines and the reason for turning off NFS. Of course, the main reason for turning off NFS is that FSFT doesn’t work completely until the two programs are separated from using the same database. Now back to the developers. I am not going to reproduce the list of approved developers here in a blog post. It would likely change before you read this post. So go to this page if you want to see what is currently approved for what level of involvement with FSFT. Of course, there may be some who are certified at the last minute, but they haven't yet updated the page, so I would check back next week to see how things stack up. Those of us using New.FamilySearch.org in the past got an email notice about moving our sources over to Family Tree. Essentially, the sources got moved if we opted out of responding. Now, this presents a really interesting question; what sources were there in New.FamilySearch.org that were worth moving over to Family Tree? There are, at least, 200 or 300 such sources listed similar to these for this individual. Finding something relevant and useful seems almost futile. 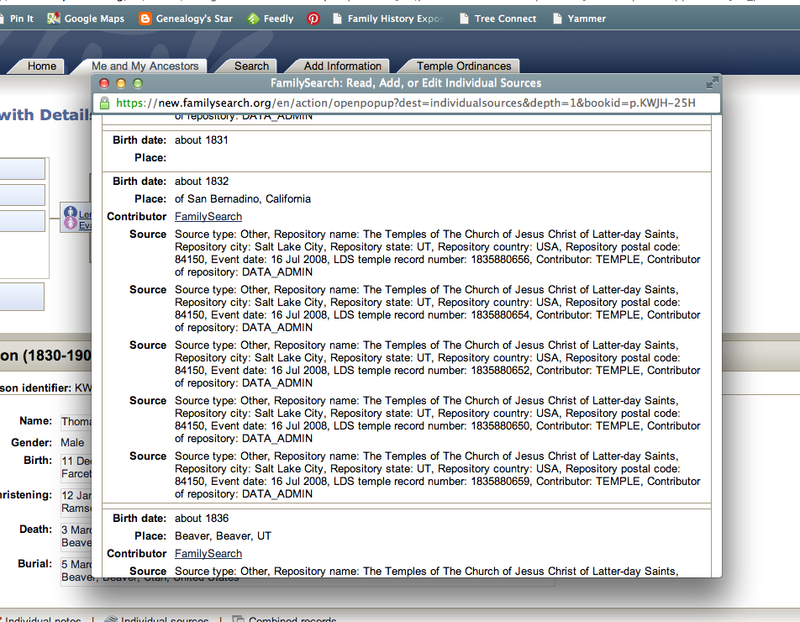 I guess I am not sure what FamilySearch means when they say they are going to "move the sources to Family Tree?" Do they mean all this stuff? What is that supposed to do to help me or anyone else? I am aware that some people were persistent and actually entered valuable sources into the system. How is anyone supposed to know what is good and what is junk? 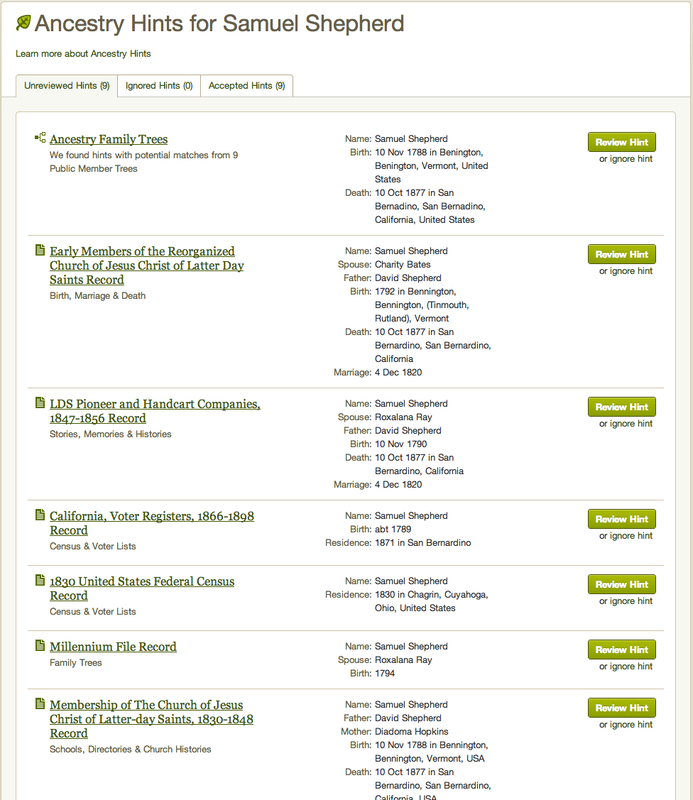 Most of the entries for my ancestors in New.FamilySearch.org have very similar lists of sources. I am not sure what I am supposed to do with that or why I would care. There is a reference to a Batch number, F51266. The "F" designation means that the source of the record was from a "Family Entry. Patron submitted family group records. Some dates or places are estimates." You can find a list of all the Batch number designations at IGI Batch Number Descriptions in the FamilySearch Research Wiki. This particular source was one of 73 submitted by user jlmshelley338424 and was grouped with others as sources for the first name of the ancestor. I am really wondering what I am going to do if all this stuff shows up in Family Tree? We are all inundated in a fog of historical documents. Most of the time, as genealogists, I think we feel that the documents are hiding from us. In reality, they are there, but we see too much and have limited ways of distinguishing which of all the documents that exist pertain to our own research. So how do penetrate the historical fog that seems to surround us in every direction? Fundamentally, we need to understand the fog. We need to know the extent of the documentation and the limitations. In short, we need to know the context of our searches; what is and what is not possible. Unless we understand this need and do something about it, we will be forever wandering in the fog and never find what we are seeking. For example, one part of this overwhelming fog is on the Ancestry.com website. There are presently, 31,344 collections with billions of entries. If we add in all the collections on MyHeritage.com, FamilySearch.org and findmypast.com, we certainly have a formidable fog of sources. Fortunately, each of those vast collections of documents have more or less useful tools for navigating our way through the mass of data forming the fog. I say "less" because the indexes created by any one or all of these programs as only as good as the ability of the indexers to read and interpret the original documents. For this reason, the first step in making our way through this fog should be to limit the size of the fogged area, i.e. through filtering out collections that have nothing to do with our own particular search. Each of these programs give us the ability to search a single database, rather than confronting the entire set of collections all at once. My rule is always to search the individual databases and use global searches only very judiciously, if you expect to find the target ancestor quite easily. 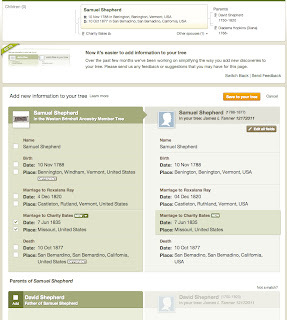 In Ancestry.com, searching an individual collection is quite simple. All you do is go to the "Card Catalog" (also see all collections) and find individual collections that may apply to the area where your ancestor lived at the time of the target events. So, if my ancestor lived in Navajo County, Arizona in 1920, I would limit my search to Ancestry.com collections that might have documents pertaining to that time and place. As we move into other online documents or even those yet to be digitized, we can use the same method to open up our view of the documents and bring them out of the fog. You might notice that the task of searching for relavant documents can be made a whole lot simpler by focusing on the time and place of an event rather than randomly making our way with huge general searches. The fact is that the fog becomes almost transparent, the more we know about the time, surroundings, background and history of the events we are researching. This background information comes from extensive study of the history of the area where our ancestors lived. You will always be in a fog as long as you don't know the background and history of the events and people you are searching. The next few days, I will be in Sacramento, California at the Family History Expo. I hope to see some of you there and please take time to come up and say hello. We are working on some exciting things with the Family History Expo's expansion into Celebrating Family History. There is a lot of interest in this new concept of having local family history consultants operating on a party plan to provide products and support to interested genealogists. 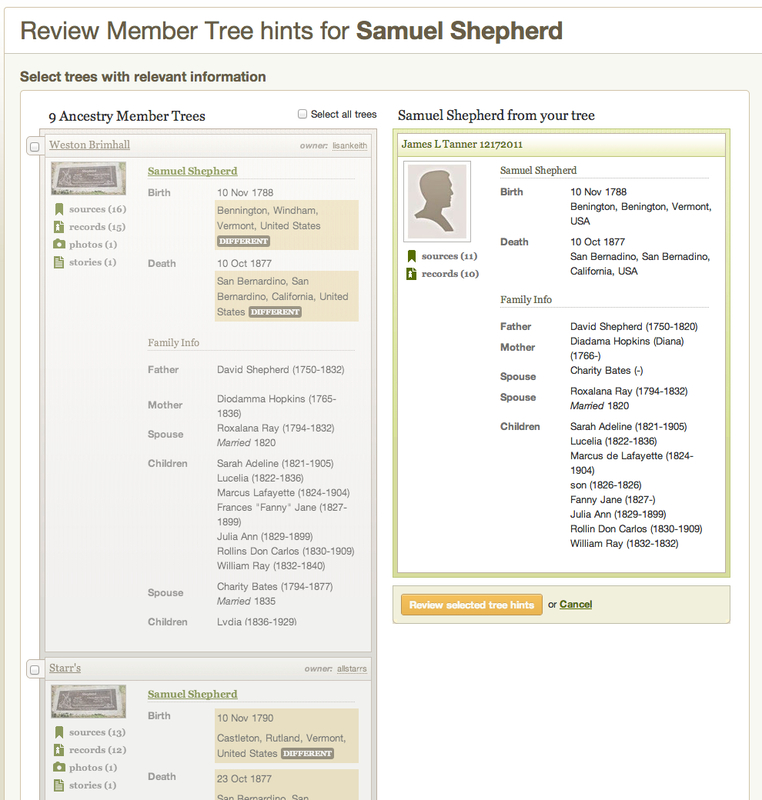 Online family trees can either be a boon or a bust. In either case, the huge number of family trees can be daunting. In my own case for example, I have several published online trees in different programs. Many of these companies send me frequent email messages about potential "matches" with other users' family trees. If I followed up on every one of these potential matches, I would have time to do little else. As it is, I ignore the vast majority of these suggested connections. 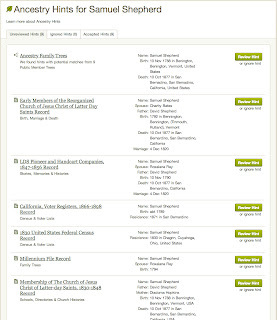 For example, in Ancestry.com right now, I have 116 "shaking leaf" suggested sources and connections. Most of those are connections to other family trees and not real "source" records. In MyHeritage.com the situation is even more dramatic. I have 273 pending "Smart Matches" and 789 new "Smart Matches." How do I tell whether or not examining this multitude of suggested matches with the work of others is going to be productive or even useful? What motivation do I have, other than the constant notification, to make such an evaluation? How many of these connections will I have to plow through to find something useful? All of these questions are really hard to answer. The existence of all these potential connections can be viewed a wonderful opportunity or a dreadful burden. Most of the time, all that is really happening is a graphic confirmation that I am related to a whole lot of people. But I do have some suggestions. Both Ancestry.com and MyHeritage.com have their own local genealogy programs. Ancestry.com has Family Tree Maker (both Windows and Mac) and MyHeritage.com has Family Tree Builder (Windows only). If you are seriously considering taking advantage of either program, having the local version of the program on your own computer will help tame the tangle. In both cases, the local program synchronize with your own online tree. So rather than spending a lot of time search around for potential matches at random, you can concentrate on just those people you are presently interested in. 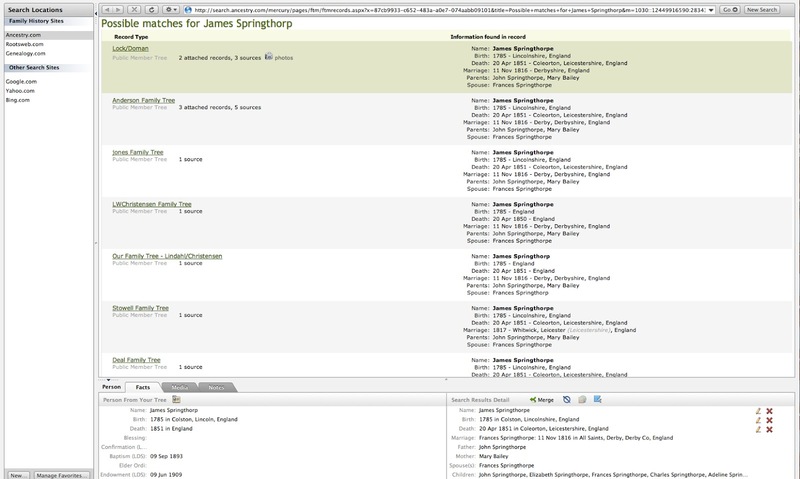 For example, even though I have a rather large number of potential "sources" including links to other family trees from Ancestry.com, when I go into the program on my computer, I am presented with those same "shaking leaf" indicators on my own database locally. So then, If I am interested in sources for a specific person, I can look at those suggested sources and ignore the rest. It doesn't really matter, other than for promotional purposes, what I have as a "total" of all of the suggested sources, all that really matters is what I am working on right now and whether or not there are any sources available for that person or family. In a sense, you have huge field and you need to put on blinders so that you focus on what your own objectives are and ignore the larger field of suggestions. If you simply take every suggested link, you will soon be lost in the online world equivalent of the wilderness. When I focus on the lines I am interested in researching, granted, I am missing out on potential connections that may be more valuable than those I am researching, but if I let that "gold fever" mentality rule my research, I will soon be off in the "gold fields" and lost to anything productive. 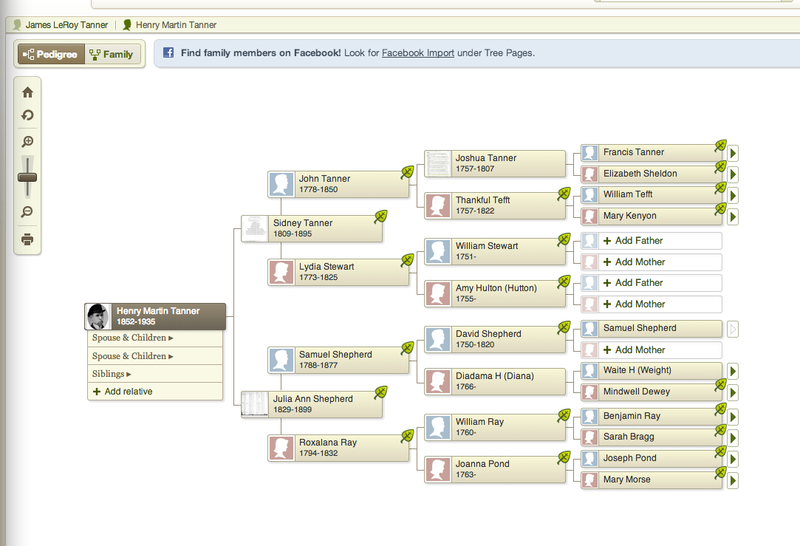 It would be really tempting to start in and add some of the information from these other family trees to my database. But I note that few of them have any sources attached and they don't all agree on dates or places. Perhaps there is more that needs to be done rather than simply copying the records and moving on? Yes. I need to verify the sources and decide for myself if the information is sufficiently persuasive to add to my own records. This may be a case where someone else has done all the work that I have not yet done, so it will be a benefit to me. But it might also be the opposite, just another case of sloppy copy work that has no value. Just because the names are in someone's family tree, gives them no validity at all. But the additional sources are certainly worth looking at and evaluating. So, family trees can be helpful, if used as a tool rather than as a copy source. History is not just names and dates. In fact, genealogy, if it is part of the general area of history, should not be just about names and dates. There is a famous quote from a movie that ends with the statement, "There are eight million stories in the naked city. This has been one of them." Well, there are uncounted millions of stories about our ancestors that are still waiting to be told. Yet, I am constantly bombarded with statements that seeking out our ancestors is little more than a crossword puzzle of filling in the names and dates on a pedigree chart. We need more than just names. We need more than just dates. We need a sense of place, a sense of the surroundings, the people and the events that made up the lives of our ancestors. Some people approach genealogy as if it were a contest, with the prize going to the one with the most names. if this is the case then why not simply look at all the online family trees, copy as many names as possible and declare yourself the winner. The stories of the lives of our ancestors is not the side show, it is the show. It is the main feature. Every time I suggest that, as genealogists, we move beyond name gathering check lists, I get snarling feedback that we don't have time to spend on mundane things like the lives of our ancestors, we are too busy pushing back the years and marking off the checkboxes on our pedigree charts to waste our time with stories. Surprise, the stories make the people and the people make the stories. The two are really inseparable. When I was a lot younger, we used to try to build towers of blocks to the ceiling. Inevitably, we would get higher than our heads and someone would bump the stack and it would come crashing down. Building a pedigree further and further back in time is like the child's tower of blocks. There is really nothing holding it up and it is very likely it will come crashing down. Stories give a wide base that will sustain a lengthy pedigree. Your building blocks become even more stable when they are made up of complete families, rather than son to father or daughter to mother chains. Let's broaden our base and build a suitable, long lasting structure. Will your children and your grandchildren hold you in high esteem because you were able to trace your lines back to the 15th Century? Or will they only remember the stories? What if there are no stories to remember? I must admit that when I started examining my own ancestry, I was more interested in the names and filling the charts, than I was in the stories that went with those names. But over the years, I found that it was only through knowing the setting, the place, the surroundings, the people and the events, that I was really able to be sure the names were correct. How do you tell the difference between five men named John Morgan, all living in the same town without examining the history, surroundings, place, setting, and the events of those people and all of the others living in that same town. Or you could, like has been done countless time before, simply give up and pick one of the five, preferably the one with the most illustrious ancestors that are the easiest to trace. I get the push back on this issue almost every time I speak or talk about this subject. People look at me as if I have lost my mind every time I suggest that they read the newspapers or a county history. I suggested a town history to a person today and was met with indifference. The person didn't seem to see the need to take the time to order the book through Interlibrary Loan. It was simply too much trouble and anyway, they already had all the names from that town and who cares about the stories. Let's get back to the interesting stuff like names and dates. Even though I type rather fast, when I was introduced to the computer mouse, I could instantly see the advantage of being able to point-and-click. I have never warmed up to track balls or touch pads, primarily because both required a clicking button or two to operate. I was always frustrated with the track pads on laptop computers, because is was awkward to click and drag items on the screen. I know some people can do this with one hand, but for me, it always took two hands and didn't work well even then. For some time now, Apple computers such as the MacBook Pro have had touch pads that used pressure from a finger to click and did away with the one or two buttons still evident on Windows laptops. At first, the touch pad system worked OK, but it was still awkward. When the Apple Magic Trackpad was introduced, I was frankly uninterested. Later, I bought a MacBook Pro laptop which I used whenever I was traveling or when I needed to move to a different room with the computer. Finally, I got enough practice on the Magic Trackpad to see the advantages of using it regularly. The biggest advantage was that the Magic Trackpad put much, much, less strain on my fingers and wrist. I was not nearly so tired after using the computer for an extended time. I also found that, with use, the Magic Trackpad was more efficient that using a mouse. Since the MT had a number of gestures available, I got used to using two fingers to right-click and swiping to change pages or scroll. It just worked more efficiently than a mouse. But there was still one major limitation. It was very difficult to click and drag anything more than a short distance. It also lacks the fine control necessary to do some types of editing. So I compromised and set up the Magic Trackpad next to my mouse. As time goes on, however, I find that I am using the mouse less and less. Still not enough to do away with the mouse, but enough to make it almost obsolete. Some technological innovations are not really an improvement on the past. They seem different but ultimately they are abandoned as inefficient. Most of the laptops now have the ability to bypass the buttons and click by tapping the pad. I find this almost as useful as the Magic Trackpad, but less responsive. I have a new Windows laptop and the trackpad works well, but is buggy because it picks up stray movements when I am typing. I do have to admit, that on occasion, the Magic Trackpad can be frustrating when you try to drag something or drop some file in a folder. It is quite a bit more difficult to use than the mouse. Since I mention using the Magic Trackpad, I thought you might want to know why I switched. I am still getting comments from more than a year ago when I wrote a post on the demise of the old FamilySearch.org website. Not the currently "old" website, but the old "old" website that had little more than the Ancestral File, the Pedigree Resource File and the International Genealogical Index (IGI). There is literally no comparison between that old website and the present FamilySearch.org website with its millions upon millions of digitized records and other resources such as the Research Wiki. So why then is there a continuing longing for the "old" old site? There is a deeper issue here, one that affects the entire pursuit of genealogy. It is the same issue that manifests itself in the continued use of Personal Ancestral File (PAF) and the almost daily challenges I face from patrons at the Mesa FamilySearch Library, who do not know how to use computers and resist any attempts to teach them, even basic skills. OK, let's get past some of the objections that have been raised in the past. First of all, I clearly recognize that some of us in the genealogical community have physical or other disabilities that prevent us from using computers as easily as others. This is not what I am talking about. Here is an example of what I am talking about. Recently, FamilySearch announced that it was discontinuing support for Personal Ancestral File (PAF). Since the last update of the program was released in 2002, this was a long overdue action. But the reaction from the genealogical community is strange. Some of the PAF users are in a panic because they think that their program is somehow going to vanish from their computers on 15 July 2013. But even for those who at least know that the program is not going change, seem upset because they are losing something they likely never used. I would note that the Ohana Software website has a prominent message that says, "Keep PAF. Keep going. It isn't dead...we promise. On the next linked page, the website says, "If you're content with the basics, keep using PAF and forge ahead in your research. If you think you're ready for a more full-featured program, FamilyInsight is also compatible with these other popular genealogy programs: RootsMagic, Family Tree Maker, Ancestral Quest, and Legacy." Now this is not a criticism of Ohana Software's FamilyInsight software, it is a comment on the fact that after more than ten years, a discontinued software program with no updates, continues to be such a viable force in the genealogical community. PAF is still so common and used that Ohana Software can sell a program that keeps it alive. Interestingly, FamilyInsight is about the same price as any one of the other "full featured" genealogical replacement programs. It is a fact of life in the computer world that things change, usually without notice. I could make a list of the programs, both online and on my computer, that have changed in the past month or so. I am talking about programs that cost over $100 just for the upgrade. When I upgrade my programs every year or so, I usually spend into the thousands of dollars. Running a computer at a high level of production is expensive. But genealogy programs are relatively cheap. The most expensive programs cost less than $100 and upgrades are usually much less than that. I am talking about Adobe Creative Suite, for example, that costs hundreds of dollars for an upgrade and the initial program standard edition has a price tag of over $1000. So why do people keep using PAF? I get a lot of reasons, mostly saying that the program is all that they need and they see no reason to learn a new program. So why the panic? Wasn't the fact that PAF's days were numbered beginning in 2002 enough of a reason to migrate over to a different program? Apparently not. The tendency to resist change is much deeper than a simple analysis of the need to move to a new program. This tendency is so ingrained that people would rather spend money on a program facilitating their use of PAF than move to a newer program that costs virtually the same and the facilitating program. I will undoubtedly get similar comments about how much the users love PAF from this post. Now where did the software developers lose the battle against PAF? Will its discontinuance make a difference? Not if Ohana Software is correct. I think that the developers of genealogy software should have treated PAF as a worthy alternative, just as if it were a viable economic competitor. Something like the adds Apple and Microsoft trade back and forth. Mostly, the developers ignore PAF, which, from my perspective, has not worked. In some case, such as RootsMagic, they say "Switching from PAF? It's easy," but only Ancestral Quest focuses on the differences between their program and PAF. Clinging to the past is a common and perfectly natural reaction to an unstable world where change is rampant. But when it comes to computers and computer programs, it is unwise. You said "We are not talking about science here. I can't conduct an independent experiment and validate your findings." Two years ago this argument may have been mostly true. Today, genealogists do have the ability to scientifically verify the results of their paper "proofs". DNA does not lie. Autosomal DNA testing and the tools developed for working with this data is available now. It allows us to scientifically prove the validity of our methodology findings. It is not cheap ($100 to $200 range depending on current sales), but it is getting there very fast. It is already less then the cost of traveling to a distant repository. It does require the participation of other descendants, but social networking and on-line trees make them easier to find then ever. It does require time and does not replace paper based proofs, but it certainly is science and it can produce your "proof". Hmm. You may or may not have noticed that I stay well away from certain topics. The reasons for this are complex. For example, I am an active and participating member of The Church of Jesus Christ of Latter-day Saints and a Church Service Missionary at the Mesa FamilySearch Library, but I do not usually comment in this Blog on either Church doctrine or Church procedures. It is not they do not impact my beliefs and practices, but I have chosen to address the larger genealogical community as such from the standpoint of genealogy. In this position, I mirror the attitude of the FamilySearch Centers around the world. Normally and if things are operating properly, anyone should be able to utilize the FamilySearch Centers and Libraries without concern that they will be "proselytized" by the Mormon missionaries. I feel the same way about this Blog. In the proper context, I am very much involved in all the religious aspects of my beliefs about genealogy. There is a time and a place for everything. Likewise, I refrain from expressing political viewpoints unless they relate directly to genealogy. However, I am very opinionated and vocal about the impact of law and legal matters on genealogy. SNP based testing: "The reliability of this type of test is dependent on comparative population size, the number of markers tested, the ancestry informative value of the SNPs tested, and the degree of admixture in the person tested." STR tests: "As most STR analysis examines markers chosen for their high intra-group variation, the utility of these particular STR markers to access inter-group relationships may be greatly diminished." Biorgeographical ancestry: "As studies from more populations are included, the accuracy of results should improve, leading to a more informative picture of one's ancestry." Now, some people are overwhelmed with the results of their DNA testing and firm believers in its efficacy. Others, with less useful results are skeptical of the usefulness of the procedures." As discussed and used by various DNA service providers, there are some things they do well and other things they do not do well. I strongly suggest that if you are interested in DNA testing, you become adequately educated as to the procedures, types of testing and validity of the results. As for me, I think that although it may be a scientific procedure and has been used for years in both criminal and civil actions, I am not personally convinced that it can provide generally useful genealogical evidence except in some very limited cases. For that reason and others, I have stayed away from getting involved either for or against the use of DNA in genealogy. For a fairly good analysis of the problems and challenges from a legal standpoint, see DNA Evidence. So I guess I would agree with the last statement made by the commentator above, DNA does not replace paper proofs. 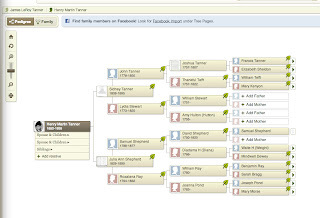 What real value is there in online family trees? Do the have any value at all? How do you use the information that you find in the online work someone else has done? What can you believe and what is beyond belief? 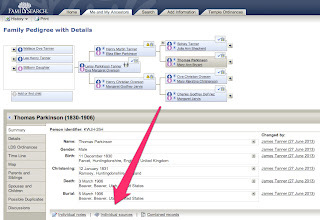 Should you add information from online family trees to your own files? All of these, and many more, are valid questions that confront anyone doing online genealogy today. A search in any one of the online databases will often bring up suggested corresponding ancestors in online publicly available pedigrees. Is this information valuable or just a complete waste of time? I have been known to regularly rant and rail against the sloppy, inaccurate, less than helpful, duplicative and misleading entries in online family trees. But the number of entries on these trees means that there is always the slight possibility that someone else has found a clue to your family that you are not aware of. So do you spend time combing through these files ( a quick way to go completely out of your mind) or do you try to evaluate the information in the files to see if there is any value? I would like to make some suggestions in this regard. First, and the easiest way to decide if the information is correct, is to look at who put the information into the online family tree. Over time, I have become acquainted with some of the online researchers through looking at the kinds of entries they make. If I see information from certain people, I assume that it is reasonable and may be reliable. Others, I copy automatically, because my experience is that they are meticulous researchers and would never add an entry without supporting sources. But do I automatically incorporate the information into the master copy of my own family tree? Only if I can independently verify the information, either by examining the source or talking to the person who submitted the information to verify that they have a valid reason for incorporation. Now, very little of the online information falls into this category. Let me give a couple of examples of how I work. First of all, not all of these suggestions are my Samuel Shepherd. I have to look closely at each one of the suggested sources to make sure they are talking about my ancestor and not someone else with the same or similar name. For this person, there are 9 potential matches from Public Member Trees. I could simply ignore these suggestions, but in this case, I decide to look at them. I do this by clicking on the link to "Review Hint." Now it gets a lot more complicated. There are differences between the information in my family tree and the one from the other user. I have to make a value judgment as to whether or not to incorporate the information into my family tree or not. It is essentially a lot of work and I had better be prepared to make those decisions before I add any information to my own tree. Sometimes, the various online programs give links to other trees but do not go through the extensive process employed by Ancestry.com to give additional information. Then you have to decide if you want to copy the information or not. Under no circumstances do I assume that the information is automatically correct and incorporate it into my master copy of my family file. 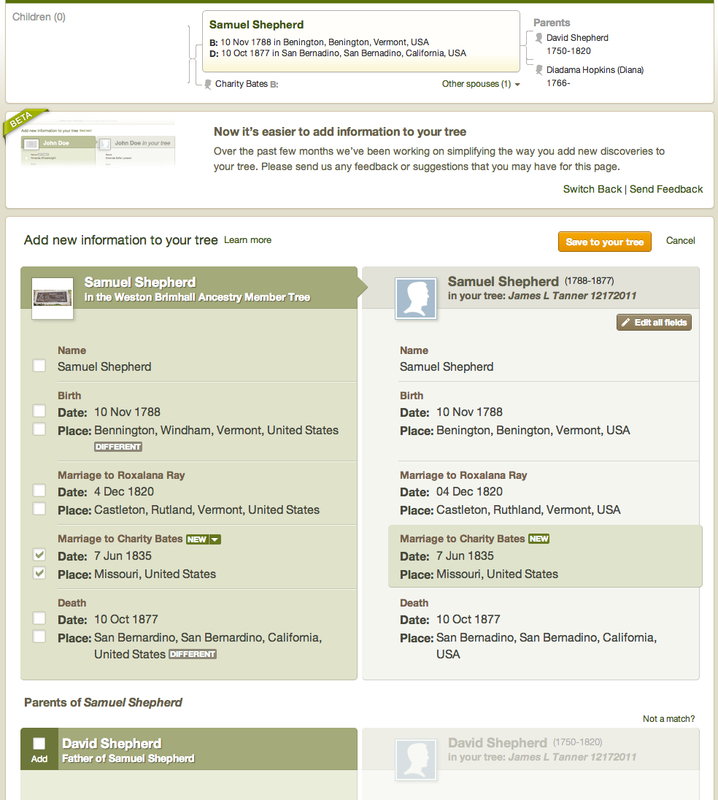 Now, programs such as FamilySearch.org's Family Tree are entirely different. There everyone is looking at the same person. 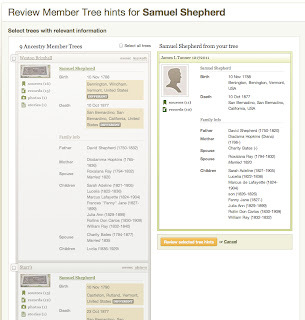 There is no "my family tree" to compare, so you need your own copy of your own genealogy on your own computer to make a decision as to whether the information shown is correct or not. There is a lot more to be said in this regard and I will likely return to this issue in the near future. I ran across an article on makeuseof.com entitled, "How to Access A Deceased Relative's Digital Accounts." I found the article interesting because it failed to raise any issues at all involving the interest of a deceased person's estate and heirs in the online digital accounts discussed. Following the advice given in the article, without proper authority from the deceased person's estates, could result in serious legal liability. All in all, the article was accurate as far as it went, but entirely misleading. As genealogists, we may be in a unique position to have an interest in a deceased online legacy. But it is extremely important that our interest does not lead us to become involved in legal action and family fights and controversy. There are some important principles here completely ignored by the popularly written article and commonly spread throughout the Internet. The basic principle is this: when a person dies, everything the deceased person owns, either real or personal property including any online files or assets, passes to his or her estate. This is automatic and without exception in every state in the United States. This legal fact has nothing at all to do with the court action we call probate. Whether or not a person's estate needs to be probated through the court system is determined by the laws of the jurisdiction where the person dies and/or the jurisdiction where the property is located. Whether or not a probate is needed may also be determined by the value of the assets of the estate. Some very small value estates do not have to be probated in some jurisdictions. There are also methods to transfer ownership of both real and personal property to trusts, partnerships, joint ownership with survivorship, limited liability companies and other entities before a person dies that may reduce the need and may eliminate the need for court probate of the person's property. In today's world, as I have written before, there is a huge gap between the reality of online digital assets and the provisions of state laws in the United States establishing rules and procedures for handling these types of assets. So despite the advice given in the article, the tips given do NOT start you out in the right direction. First and foremost before access any deceased person's online accounts, you must determine if you have the legal right to do so. If you have any question at all about this issue, you need to consult competent legal authority. The online accounts are definitely considered an asset of the deceased person's estate. If you do not have the legal right or authority to access those accounts you could be liable for damages in an action brought by the estate or the rightful heirs or both. Jumping in and accessing a deceased online records without the proper legal authority to do so, may even be considered theft or conversion. But this leaves a very real problem. What if you are the only person with access to the accounts and know that something needs to be done? Unfortunately, the answers you get from lawyers will vary greatly depending on the background and experience of the professional asked. But aside from the legal issues involved, there are real family issues that also must be addressed. Just as it is common for heirs to fight over physical assets, it is inevitable that there will also be disagreements over the online assets of a deceased person. There is one sure way to avoid any kind of controversy upon your own death: don't own anything when you die. Of course, that is difficult and unworkable, but the principle is clear: transfer all of the title to your property to a trust or other entity before you die. Then your trustee has a clear legal right manage, access and dispose of any and all your property. Make sure your trustee has all the information her or she needs to access your online accounts and to a great extent, the problem is solved. It might also be a good idea, as genealogists, to appoint trustees that have a sensitivity to the need to preserve records and continue on with the deceased person's work. This entire issue bears attention. Meanwhile, be aware that this a developing area of the law and there may be reasonable, yet conflicting opinions among various legal practitioners. A Tablet will never replace my 27" monitor. There are two things that I can say with absolute certainty about my future in computers; I will never give up a full-size, good action keyboard and I will never give up a large screen monitor (or two or more). That said, it follows that the poke and swipe world of tablet computers will not make much of a difference to me either now or in the foreseeable future. Now, don't get me wrong. I have an iPhone and an iPad. I use a Magic Touchpad almost exclusively to control my desktop computer rather than using a mouse. I use a mouse only for high precision selection and dragging files. But as you can probably tell, if you read this blog, I type a lot. There is no virtual keyboard that can come close to a well balanced and responsive, full-size keyboard. In fact, I am pretty picky about my keyboards and will scrap one that doesn't work well enough and buy a good keyboard. If the Apple keyboard works, then fine and good, but if not I will buy whatever works the best. If you are fighting with your keyboard, get a life and buy a new keyboard. Sit down at a few computers (libraries, FamilySearch Centers, etc.) and try the standard type keyboards. There is nothing that says I can't use a different keyboard than the one that came with my computer and that goes for Apple also. Screen territory is crucial. I spend a huge amount of time looking at a computer screen and I am not going to sit there and work with some squishy little tablet screen. I need space. I am usually working on more than one window at once and I need the space to have windows open side-by-side so I can work more efficiently. If you are working with a squinty little screen, get to the nearest electronics store or go online and buy a larger monitor. Make sure your computer can connect to the new monitor, but buy high resolution and large size. I would make this a priority over food and any possible entertainment. In looking at Amazon.com, I see several 27" monitors for under $300 and some for under $200. You can always spend a lot of money on better or newer equipment, but always look at the lowest price models first to get an idea what the "upgraded" models are really going to do for you. Now where do I go from there? Another reason a tablet will NEVER replace my large screen, keyboard connected computer is the speed and variety of programs. Granted, if all you do is email and type a few documents and maybe run a genealogy program, you may end up working off of a tablet computer. I will never run Adobe Photoshop on a tablet, a laptop yes, but a tablet no. Whenever I talk about hardware, I always get comments from the folks who are living on a very small budget and complain that I am insensitive to their economic condition. Please. I am painfully aware of the limitations on resources many genealogists suffer. But I am also aware when talking to people that we buy and spend what we want to regardless of our economic level. Some of us may think nothing of taking a weekend trip to Hawaii or New York City, but some of us have to think about our finances every minute of every day. But what I am saying is that we need to put our resources to the best use. When someone drives up to the FamilySearch Library in a Lexus, any protestations of spending $20 on a genealogy program or $200 on a monitor fall on my deaf ears. If you are really in such poor circumstances that my suggestions seem extravagant, then start advertising your condition. I have given away or donated probably five computers in the last year. I have two right now I can't give away and will likely end up donating. I suggest that if you make your need known, there will be some one out there in the genealogy community that has an extra computer or is upgrading that would be more than willing to share their old machine with you. Maybe we need a central area to post our old computers where we would be willing to give them to some genealogist who needs one? How do the online family tree programs compare? More changes coming to FamilySearch.org?